Single Dad Brad: Harry Potter and The Line of DOOM!!! Harry Potter and The Line of DOOM!!! My 10 year old son Gibson LOVES to read!!! I will often have to go down to his bedroom at night and tell him that it's time for lights out. He will say "Okay dad...just let me finish this chapter". Gibson loves all kinds of books, both fiction and non-fiction. When he first started reading he was obsessed with those Guinness Book of World Records books. He would tell me all about the "Largest Rubber Band Ball" or "The Oldest Living Tortoise". He became a virtual encyclopedia of useless trivia! He also enjoyed fiction books. He discovered the Junie B. Jones series and would anxiously await the next book to be released. I think he read them all two or three times. Then last year he started in on the Harry Potter series. We would make trips to the bookstore with his allowance and he would come home with his new Harry Potter book and burn through 800 pages in two weeks! 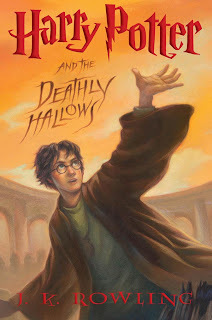 So when he finished the last book available, he began anxiously awaiting the release of the much anticipated "Harry Potter and the Deathly Hallows"!!! For the past two months he has been talking about the release date. "Dad, we need to be sure and get down to the bookstore as soon as it comes out!" You could just hear the excitement in his voice. And this is a child who rarely asks for anything, so I knew this was important. Well the day of the book release was upon us and I heard about a book release party at Barnes and Noble. It was a Friday night and I didn't have a date, so I thought we would go down and check it out. My son was excited as we arrived at the bookstore. There were Harry Potter fans all over the parking lot and in the bookstore dressed up as the characters in the book. The bookstore was crowded and there were a few die-hard fans lined up outside with their lawn chairs. So we approached the table they had set up outside and asked how we could buy a book. The book was to be released at midnight. Those who had pre-ordered the book would receive a gold wristband and the others would receive a blue wristband. These wristbands would guarantee that you would receive a book. So we got our blue wristband and went inside. I asked a young man who worked there how the sales process would work once midnight arrived. He said they would call people in to the store based on the letter on their wristband. Gold first and then blue. I looked at my wristband and it said "E". I looked back at him and sensing my concern he said "It will go fast!" Famous last words!!! It was about 9:30 p.m. and I let the kids wander around the bookstore taking in all the excitement and atmosphere. By 10:00 p.m. they were getting bored, so I decided to take them home and come back later to buy the book. I went home, tucked them in bed and waited for midnight. When midnight arrived the scene had changed quite a bit. People were now outside the bookstore in two lines (gold wristbands and blue wristbands). There must have been a thousand people. I walked up to the front to see what was going on. There was a guy doing his best bouncer imitation letting only 5 people in at a time. FIVE PEOPLE!!! I went back in the blue wristband line and found my fellow "E" wristband comrades. Like lemmings we stood there watching people come out of the bookstore with their new Harry Potter books. They were smiling, dancing and shouting with joy! We began talking and I told my fellow line mates that they were only letting 5 people in at a time. After twenty minutes, we realized this was going to be a long process. Thank goodness for the guy behind me who was talking to his sister on his cell phone. I overheard him say that she had just bought the book at Deseret Bookstore and there was no line! I asked him "Where is Deseret Bookstore?" He pointed and said "It's right around the corner". That's all I needed to hear! I was out of line and headed towards the promised land. I got there and they were selling their last box of Harry Potter books. The man in front of me bought his book for $26. He informed the cashier that they were selling the books at Barnes and Noble for $20. She said "If you would have told me before I processed the sale, I could have matched that price." Happy to have his book he walked away giving me a generous smile and said "I just saved you six bucks!" I stepped up and said Harry Potter please and they are selling the book for $20 at Barnes and Noble. She sold me the book for $20 and I walked out proudly holding my copy of "Harry Potter and the Deathly Hallows"!!! As I walked by the crowd of people still lined up at Barnes and Noble, I heard someone say "They are selling the books at Walmart and there is no line!" But nobody moved. Perhaps they thought he was lying. Maybe they didn't want to move unless another lemming took the first step. I don't know and to be honest as long as I had that book for my son...I didn't really care!!! I went home, put the book by my son's bed and fell asleep grateful that this is the last book in the Harry Potter series!! !